Purvanchal bank is one among the popular banks in Uttar Pradesh. If you have an account with Purvanchal Bank, you must be aware of the advanced and modernized banking services. You must stay updated with the account balance being a responsible person. There are several ways of making a balance enquiry. You may not have information about the different methods of balance inquiry. 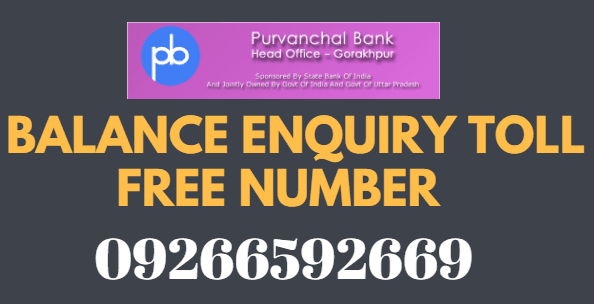 On this page, you can learn about the ways of Purvanchal Bank balance enquiry. Dial 09266592669 from your registered mobile number and give a missed call. Within few minutes you will receive an SMS stating the current balance in the account linked to the mobile number. Important note: To know account balance via missed call, your mobile number should be registered for missed call and SMS alerts. Visit to your home branch for registration or you can submit an online request by visiting official site http://purvanchalbank.com/ServiceRequestApplication.aspx. Just enter your name, address, phone number and others details as mentioned in your bank passbook, and submit the application online. Don't forget to tick on required service in the application form. You can also access internet banking service to make a balance inquiry. Visiting the ATM and using the Debit Card to make balance inquiry is another option. To get updated information about the available balance in the account, you can update the passbook and get the list of the transactions immediately. The advanced option like missed call service is the most accessible means of balance inquiry. The dedicated number is toll free, and you need not pay any charges to access the service. You can access the service round the clock without hesitating. Other options like Internet Banking or visiting the ATM or updating the passbook are time-consuming indeed! You can access any of the methods and get updated info about the available balance in the account. Stay updated with the account transactions and account balance. Purvanchal bank balance check by a missed call.